Words like “courage,” “humor,” and “smart” are frequently deployed when describing Roxane. Her collection of essays, Bad Feminist, is universally considered the quintessential exploration of modern feminism. NPR named it one of the best books of the year and Salon declared the book “trailblazing.” Her powerful debut novel, An Untamed State, was long listed for the Flaherty-Dunnan First Novel Prize. In 2017, Roxane released her highly anticipated memoir, Hunger: A Memoir of (My) Body, as well as a collection of short stories titled Difficult Women. 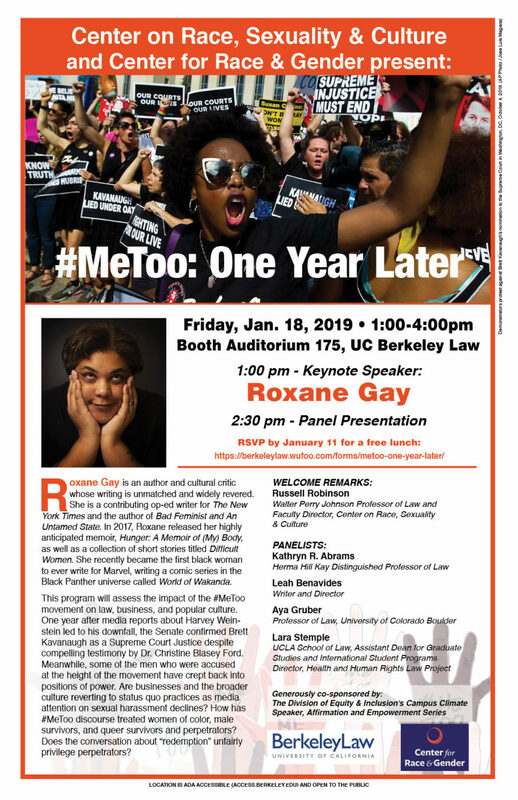 Roxane Gay is a contributing op-ed writer for The New York Times, was the co-editor of PANK, and formerly was the non-fiction editor at The Rumpus. Her writing has also appeared in McSweeney’s, The Nation and many other publications. She recently became the first black woman to ever write for Marvel, writing a comic series in the Black Panther universe called World of Wakanda. Roxane fronts a small army of avid fans on social media and when she finds the time, she dominates the occasional Scrabble tournament. This program will assess the impact of the #MeToo movement on law, business, and popular culture. One year after media reports about Harvey Weinstein led to his downfall, the Senate confirmed Brett Kavanaugh as a Supreme Court justice despite compelling testimony by Dr. Christine Blasey Ford. Meanwhile, some of the men who were accused at the height of the movement have crept back into positions of power. Are businesses and the broader culture reverting to status quo practices as media attention on sexual harassment declines? How has #MeToo discourse treated women of color, male survivors, and queer survivors and perpetrators? Does the conversation about “redemption” unfairly privilege perpetrators?